Or maybe it was the left foot. I'm not sure I really remember. But, I do remember this delicious pizza. And I've been lusting after it all year. Not as bad as it sounds, considering we last made this delicious pie on New Year's Eve. But, when a food haunts you like this has... it's none too pleasant. It's tradition for us to celebrate New Year's Eve at home in the company of our good friend Steph. It's customary for us to get together the week before Christmas to choose a theme for our celebration. And then we spend the days before New Year's gathering up a slew of great looking recipes to challenge us in the kitchen. Last year, we cooked up an amazing Greek feast that took us at least two days to consume. This year, we decided to go simple. We picked pizza. And it was fabulous. We stocked up on cheese, vegetables, and meats. A few days ahead we made up a batch of hybrid sourdough ala Cakewalk (using beer instead of buttermilk). And then we put our creative thinking caps on. We made a host of stellar pies. We paired shredded brussels sprouts with bacon and caramelized onions. We indulged in a wild mushroom pizza with sheep's milk truffle cheese. There was spanikopita pizza topped with spinach, feta, and dill, and a homemade Italian sausage 'za with peppers and spinach. And yet, my favorite remained. 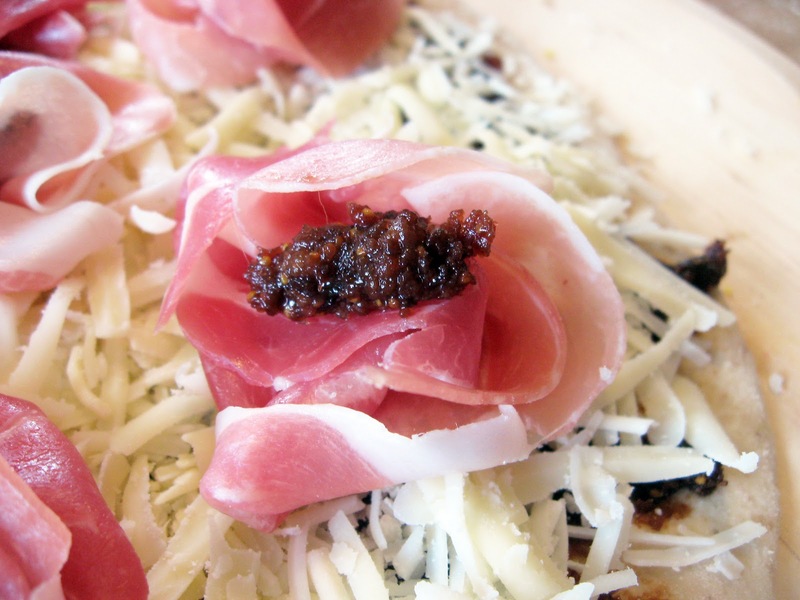 Fig and proscuitto. I know it sounds like a gourmet cliche. But, I can't withhold my praise. It was wonderful. And oh-so-simple. An instance where the quality and simplicity of ingredients results in something far greater than the sum of its parts. First, we took a handful of chopped dried figs, cooked down in a bit of water and mashed into a paste. 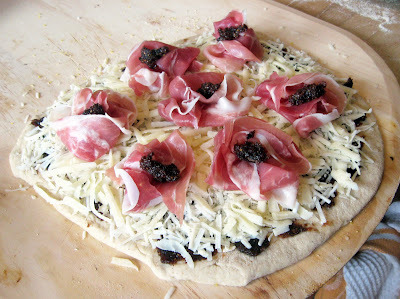 After adding a pinch of salt, we had a deliciously nectarous sauce, which we spread on the uncooked pizza dough. We covered the fig paste with a liberal sprinkling of one of my favorite cheeses, Kerrygold Dubliner, along with a bit of shredded Romano. As a final gesture, we topped the pizza with lovely little rosettes of proscuitto (with a little dollop of fig in the center of each, just for good measure. The finished product was crisp and caramelized. Sweet and savory. The cheese was sharp and nutty, with the bite and crystalline qualities of Parmesan, we suspected that this would be the perfect foil for the sweet figs... and it really was. And the proscuitto rosettes crisped up into the most delicious little bundles of pig we'd ever tasted. What a nearly perfect way to end a far-from-perfect year. That's a fine looking pizza. 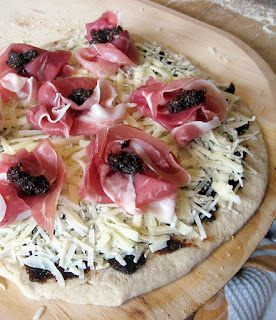 Love those prosciutto rosettes! I love those burnt cheese on the sides. 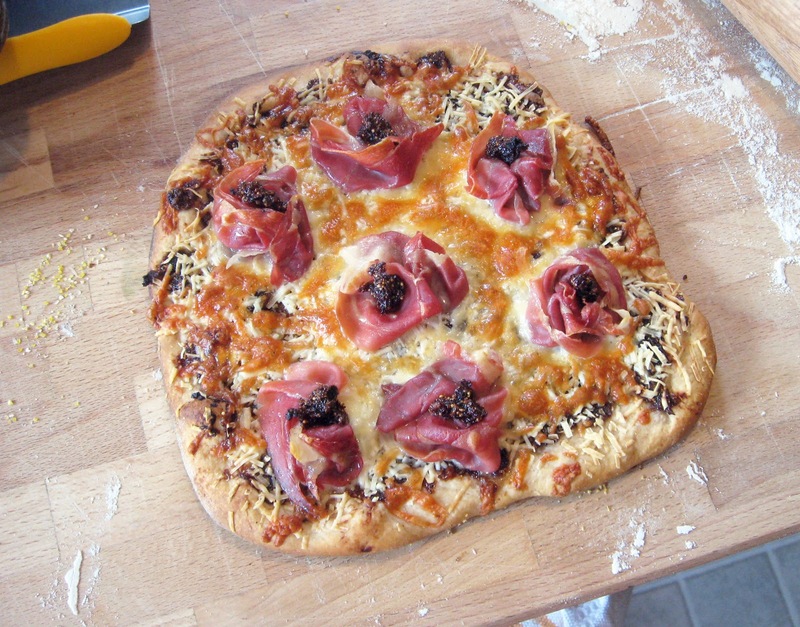 Those caramelized onions are a unique way to a great pizza. I need those recipe for the pizza! It does look Delicious!! I love non-conventional pizzas! Wow! That is so beautiful! I thought it was pickled ginger at first! Sounds soooo good! Happy New Year! Oh that sounds like a great pizza & a great way to spend new years! Way to jazz up pizza night! Did you use a pizza stone or baking stone? @Sara - Yes, we always use a baking stone for cooking our pizza. That, combined with preheating the oven to 500F for about a half hour before baking, ensures a nice crisp crust!